As higher ed professionals, we know that college is often a stressful time in a person’s life. But in today’s climate, that stress isn’t just coursework and getting used to a new environment. For underrepresented students today, stress often stems from not feeling fully welcome or supported — especially if they attend Predominantly White Institutions (PWIs). A study from The University of Texas at Austin published in the Journal of Counseling Psychology in 2017 shows that underrepresented students coming in to college can feel imposter syndrome at a higher rate than their white peers, which in turn affects their mental health negatively. In addition to the stress of college than any first-year student feels, it seems as though every day there is a new, distressing story in the national media that can cause particularly high levels of distress for students from marginalized communities. According to an NBC News article, there were 330 bias-related incidents reported on college campuses between November 9 2016 to March 31 2017. 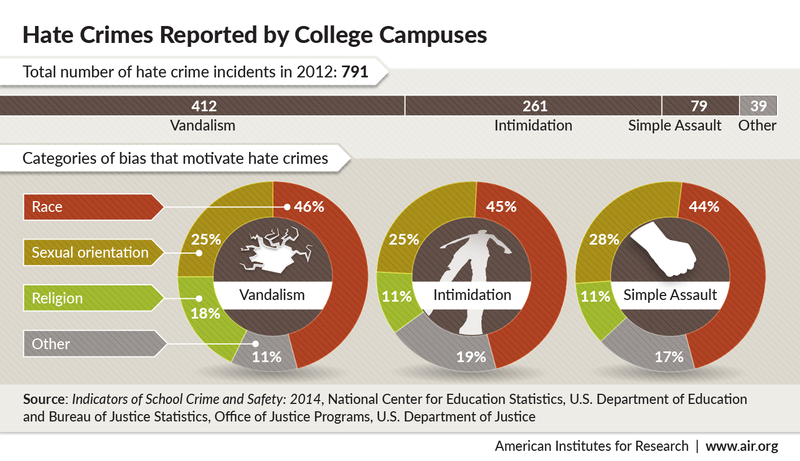 The American Institutes for Research reports that in 2012, there were 791 total hate crimes on college campuses. That means that if the rate of bias-related incidents continues as it did through the early part of 2017, we could see 843 bias-related incidents by the end of the year — and increase of 52 over 2012. Much of the student activism that has come as a result of these instances has focused on increasing the diversity of faculty and staff, mandatory diversity trainings, increased funding for cultural resource centers, and an expansion of mental health resources. With these incidents on the rise it is more important than ever for student affairs professionals to be able to serve students from diverse backgrounds. Here are a few ways to ensure that we are best serving these students. Before students even arrive to campus, know where your campus’ resources are and how to connect students to them. Get in touch with your university’s orientation or first-year experience team and learn about what programming is done — if any — for incoming students from underrepresented backgrounds. Build relationships with the people who work in relevant departments. And when your institution or department offers trainings related to supporting underrepresented students, attend them. Devoting time at the beginning of a student meeting to just check on how they as an individual are doing can make a world of difference. These check-ins are particularly important after a potentially traumatic event may have occurred. After the death of Keith Lamont Scott in North Carolina in September 2016, I began my day in the office by reaching out to the Executive Team of the African-American student group that I advise. At a time where there were no solutions and no answers, I simply wanted to make myself available and make sure they knew that I was there to support them and just listen to them. Although we may not always be able to solve the problem directly, sometimes just being that sounding board for students can make a big difference, especially when they may not have other resources. If you feel you need support in order to enter into those conversations, reach out to your institution’s counseling department for resources and trauma-informed best practices. We often get caught up in our busy schedules and can forget that we are here to serve students first. Balancing everything on our to-do lists can be overwhelming, but sometimes we need to put some things on hold to create time to support our students. Not responding to an email or rushing out the door because of your busy schedule can be seen as dismissive by anyone, and when we’re working with historically underserved and underrepresented students, that feeling can be amplified. Especially in times of crisis, a student may need to meet or talk at a time that conflicts with another appointment on your calendar. Moving our schedules around might be stressful in that moment, but it shows your students that you are truly there for them and that you recognize that their schedules are also busy. One of the most frustrating human experiences is feeling like our concerns are being dismissed or ignored. In 2006, a study found that people spent 40% of their days listening to others, but that we retained only 25% of what we heard. It is important when dealing with situations that can be stressful and traumatic for students listen thoroughly. Sometimes, we think we are trying to explain all sides of the situation or that we’re giving more context, but to students, that can come across as us not taking their concerns seriously. Practicing active listening skills is a good way to prepare for conversations like these. Active listening is a necessary skill for our work with students (and in life), and can be especially helpful for students struggling in a larger group setting. It’s easy talk a good talk and say that you do all of these things, but none of that matters if it isn’t backed up by action. Following up on conversations is a critical part of this work. Try to think of active ways to support students: think of resources that would be beneficial and go the extra mile to connect your students to them. Try to remember the little details they tell you, and ask how things are going. Supporting these students is not a one-and-done event. You have to follow-up. And if these are students whom you supervise, keep a running document to help you strengthen that long-term relationship. As student affairs practitioners at PWIs, we are in a unique position to be able to support students during what may be an exceptionally stressful time. By following these steps, we can help students feel supported and encouraged. How do you help your students feel supported? Let us know on Twitter @HelloPresence and @Ruben_Market.